Image by the Frontier Group and U.S. PIRG. When the news went around last year that Helsinki was planning to “make car ownership pointless within 10 years,” it was misread in some quarters as a plan to remove cars completely from the Finnish capital. But Helsinki’s actual plan was to use a combination, or “web,” of smartphone apps, carsharing, bikesharing, ridesourcing, taxis and mass transit — and, of course, walking and biking — to remove the need for people to own a car. 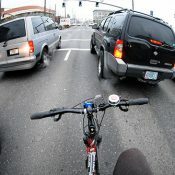 The mistake was telling, because the whole point of these new, rapidly growing tools is to stop “using a car” from meaning the same thing as “owning a car.” Once we can break the link between car ownership and car use, the theory goes, many more people will opt out of the all-you-can-drive buffet of car ownership and instead use cars only for the sort of trips that cars are actually good at. 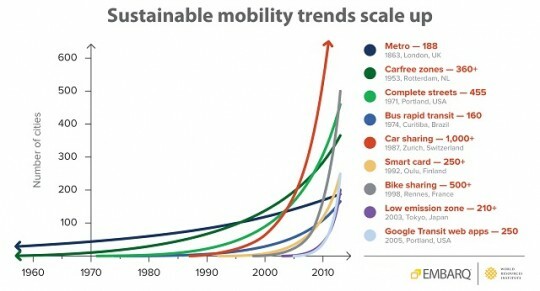 Image and data: EMBARQ via Sustainable Cities Collective. 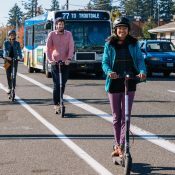 Portland was marked as offering at least one service in every category except ridesharing and bike sharing but made up for its most unusual gap (bike sharing) by offering a relatively unusual service (virtual ticketing). The PIRG ranking broke ties based on the amount of competition within each category, which is what pushed Portland one step above Denver, Minneapolis, San Diego and Seattle, but one step below Boston, Los Angeles, and New York. 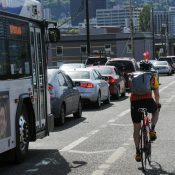 It was in April 2007 that Alan Durning of Seattle’s Sightline Institute named “car-head,” the misconception that “automobile” is basically a synonym for “transportation,” as the mental condition that causes many of our cities’ problems. That was two months before the Apple iPhone went on sale. The eight years that have followed have brought us within reach of eradicating car-head, at least in big cities. We’ll be eager to see what happens next. People think LA’s transit system is nonexistent; but BP has done stories in the past (or at least linked to them) how some people are able to successfully live car-free in LA. I was just down there (first Long Beach, then Anaheim) for a Disney vacation. Staying in Anaheim without a car was interesting. We stayed at an AirBnB location about a mile away from the part but use the ART (Anaheim Resort Transit) every day to get to the parks. When we wanted to get groceries I walked about 3/4 mile each way to get them (unfortunately, the closest full-service grocery store was a Walmart “Neighborhood” Market (quotes added by me) – I would have chosen another supermarket, but there was none closer than that. Still, it didn’t feel that foot-friendly to be there, but it’s not exactly the more transit-ready area of LA county. But, the city of Portland is already going to let Uber and probably lift in as well so we may be tied with LA in a pretty short time. 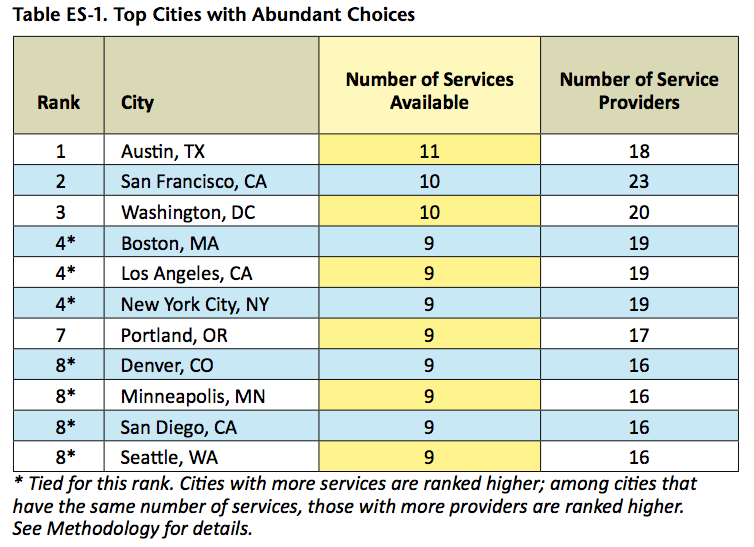 Hard to believe SF beat PDX, but then again I look at this as a rating of “apps”. I think this study doesn’t represent the real difficulty in traveling into and out of these cities by suburbanites, who likely account for the majority of the auto use rather than residents. 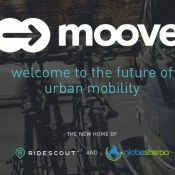 Having an index of rideshare and planning tools is nice, yeah, but it doesn’t help the majority of people who are coming into and out of cities for work and play from where they can better afford to live (yes, choose to – we’re not going there please). Rideshare from, for instance, the south bay or peninsula to SF is a big challenge, and even Uber is a costly option, and the bottom line is you’re in a car, so at best you get HOV lane privileges. Plus, you’re actually increasing VMT, really, because you’re requesting that somebody drive from somewhere else to come pick you up – usually twice. When in the Portland area MAX is a HUGE travel benefit, whereas in SF I can take Caltrain but only if we leave the city by midnight, and I still have to get to a nearby station that doesn’t happen to have secure bike parking. (Last time I saw Jerry Joseph play up there he started at almost 11 PM and we caught 1.5 songs… guess I’m still bitter ;). I was shocked on a recent trip to SF at how screwy their transit system is. And EXPENSIVE. I promise to never complain about $5 day passes on Trimet ever again. Really? I know BART can be expensive but every time I’m down there I think transit is pretty alright. And not more expensive than TriMet. 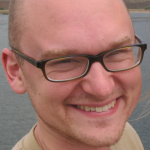 What is TriMet cost now? It’s like $2.50 right? That’s crazy to me. I’d consider using it more if I could get to SFO from Caltrain without a BART hop. They’re working on pushing BART extensions south but they still have considerable gaps if, for instance, you want to get to Oakland from the south bay. East bay into SF I still think BART beats driving but someday we hope to be able to bike all the way there. Unfortunately everybody still thinks it’s too expensive to build the western span, though they didn’t seem to mind funding the pretty light show. I find the SF transportation system quite easy and convenient once you get used to it. One thing, though. Don’t ride a bike in SF. Everybody down there is in a hurry, stressed to the breaking point, and drives like hell. And don’t get in front of a moving bus. Their drivers act like they get paid extra if the run you over. SF also has far more tourists in rental cars (both international and regionally) that may not be familiar with the driving rules of California. Certainly we already have that problem in Oregon and Portland with people that don’t understand our right turn across the bike lane rules. By the way, most of those “tourists” live here now… (and you should see them try to drive in the rain!). And I submit (as above) that any reduction in VMT by the non-car-owner is offset by additional miles many of the service-givers will drive to go fetch the customer. It just doesn’t beat having well-connected multi-modal networks in my view. I’m seeing a disconnect here — the discussion is about focusing on reducing car use rather than reducing car ownership. But of the eleven categories listed, the first six enable reducing car ownership rather than reducing car use. Although both are fine with me — one gets cars out of the travel lanes and parking lots, and the other gets them off the curb. Exactly. This is the first derivative of carhead. Because we have trouble imagining alternatives to the car, we come up with a list of car-based alternatives to the car. Frustrating, isn’t it? Austin? It may have a great public transportation system, but it’s a mega-sprawly. I remember 5-6 lane interstates with two lane frontage roads running parallel. No Thank You!